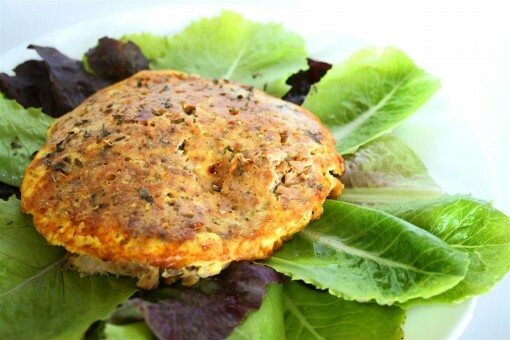 Tantalizing Tuna Burger was posted on August 16th, 2011 and is filed under Dairy Free, Gluten Free, Low Carb, Main Dishes, Protein, Recipes. This entry has 12 comments. You can follow any responses through the RSS 2.0 Comment Feed. Okay. This is definitely a recipe you need to try. It’s kind of the most amazing thing ever. I’ve been having it over and over for lunch lately because not only is it succulently delicious, it’s probably the best recipe ever for cramming in protein. If you make a giant tuna burger out of it (which is usually what I do!) it has 48grams of protein. Yup. I had been meaning to make up a tuna/salmon burger for ages and just hadn’t gotten around to it. Then one of my guy cousins told me how he made his tuna burgers (my boy cousins are those kind of dudes who love their protein!) Thanks to his inspiration I finally made my own. And I’m stuck on them now. This is really just basic tuna burger recipe. You can go crazy and use your imagination. Add chopped veggies. Spices. Fresh herbs. Melted ice cream. Okay…maybe don’t go too wild. I keep making this (a little different each time) and this variation is my favourite. I can’t wait to try it with chicken, turkey, and salmon now…so many recipe waiting to happen. Mix all of the above ingredients in a bowl. Fry in a pan spritzed with olive oil until both sides are browned. Perfect. Serves 2. Note: I sometimes just have protein for lunch, so in that case, I make one giant burger. I like to serve it on a bed of lettuce and dress it with balsamic vinegar. Lately I‘ve been playing a ton of volleyball…in fact, almost every evening. It’s by far my absolute favourite sport…I’m so in love with it. Thankfully, I have a lot of friends that are crazy about it too, so we all have a blast when we get together! I think it’s so much fun to do active, sports stuff with friends! An evening of games or dinner with friends is great too, but I think hanging out and playing sports is the cat’s pajamas! Do you make your own burgers? Do you enjoy being active with friends or more relaxing activities? I adore volleyball. I played this summer for the first time in years and we had a blast. Your post has reminded me that I wanted to look around in my area for a team. I love doing active things with friends, almost as much as I love an evening of games or food. I’ll take either one. This does look absolutely amazing! Nice, I will have to try as I’m always looking to add protien! I have never had anything like this but it sure looks like something I need to try out. We all have days where we can use an extra kick of protein! Your picture is stunning. Thanks for this recipe. Yum! I like that you use caned Tuna fish rather than fresh, more affordable and easier to work with, in my opinion. Plus, I prefer my fresh tuna raw (sushi!). My plain old tuna and mayo sandwiches are really boring these days so this is a great recipe to change things up. I WILL be making this! the other week which I have been loving. I’ve been meaning to try a tuna burger, too. This one looks so easy and so tasty. Made these for dinner… they turned out awesome. Thanks for the easy recipe! 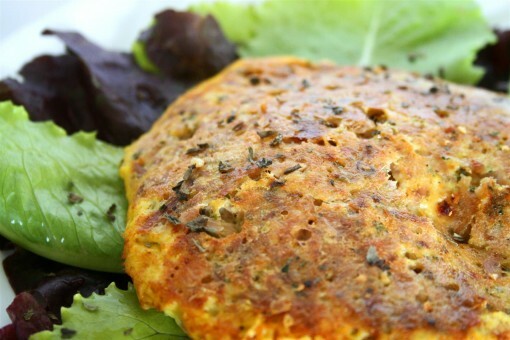 Tuna patties are one of my favorite quick and easy summer meals…I love to cram as many veggies in them as I can! These look great! LOVE THIS!!! Added cajun spice and some purple onion (just a little) SO SO SO GOOD!!!! Thank you so much!